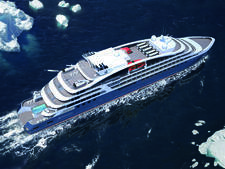 Le Bougainville will be the third in Ponant's six-ship Explorer-class of expedition vessels; it launches in August 2019. It's named for Louis-Antoine de Bougainville, an 18th-century French admiral and explorer, after whom Bougainville Island in Papua New Guinea was named. 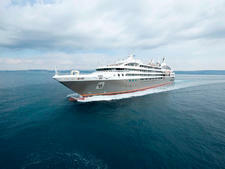 Like all the other ships in the class, Le Bougainville will hold 184 passengers in 92 cabins. The ships will have reinforced hulls for when they're in polar regions and an aft marina for sailing in tropical destinations. 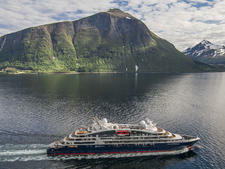 All cabins on Le Bougainville have balconies, air conditioning, two twin beds that can be pushed together to form a king-sized bed, mini-bar, flat-screen TV with video on demand, an iPod for use onboard and a desk. Bathrooms have showers and French bath products, though suites have bathtubs as well. 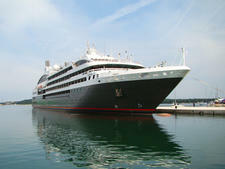 Prestige and Deluxe staterooms offer 205 square feet of space, while suites range in size from 291 to 484 square feet. Only the Privilege Suites can accommodate more than two passengers. A unique feature on all of the Explorer-class ships is the Blue Eye Lounge. Here, passengers can see passing marine life through two giant windows, shaped like a whale's eyes, inset in the ship's hull (that's right the lounge is under the water line!) as well as on digital screens projecting live images filmed by three underwater cameras. 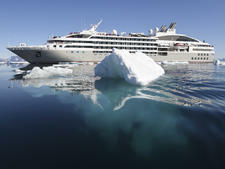 Cruisers will be able to hear the marine life as well via specially developed hydrophones, located beneath the ship's keel, which will capture noises up to 5 kilometers away. As if that weren't enough, the underwater sounds will resonate as vibrations on special sofas passengers can sit on. Another standout feature on all six ships is an aft water sports marina, from which cruisers can enter the water for swimming, kayaking and paddleboarding. A fleet of Zodiacs will also be located in the marina. 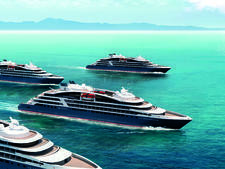 As on the other Explorer-class ships, Le Bougainville will have an infinity pool with counter-current swimming system. Other public areas include a main lounge, a 188-seat theater and a boutique. 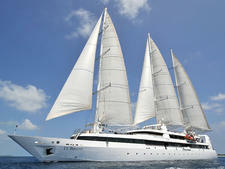 Wi-Fi on Ponant ships is complimentary. 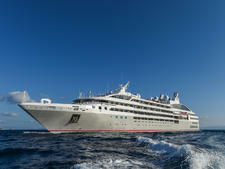 Le Bougainville will have two restaurants; as with all Ponant ships the cuisine in both venues will be French-inspired. The main restaurant (Deck 4) can fit all passengers in one sitting, while the second dining venue (Deck 3) will be more relaxed and seat just 70 people. Le Bougainville sets sail in 2019. Norwegian shipyard Vard is building the ship.